Learn the Extra-articular distal femoral resection and custom endoprosthetic replacement for osteosarcoma surgical technique with step by step instructions on OrthOracle. Our e-learning platform contains high resolution images and a certified CME of the Extra-articular distal femoral resection and custom endoprosthetic replacement for osteosarcoma surgical procedure. Osteosarcomas are the most common primary malignant bone tumour of children and young adults. These aggressive mesenchymal tumours most commonly arise in the metaphyseal regions of the distal and proximal femur, proximal tibia, proximal humerus and pelvis. The oncological principle is to widely resect the tumour with the biopsy tract in-situ with adequate surgical margins in all planes to minimise the risk of local recurrence and reconstruct the segmental osseous defect with endoprosthesis, allograft or autograft. In our centre we most frequently use custom ‘growing’ endoprostheses in younger (<13 years) children that can be lengthened as a child grows to avoid significant limb length discrepancy. These ‘growing’ endoprostheses might be non-invasive (using an internal gearbox which lengthens when an external electromagnetic field is applied) or minimally invasive (involves a small incision and manually lengthening the prosthesis with a hexagonal key) which are intermittently extended to keep pace with growth (http://www.stanmoreimplants.com/jts-non-invasive-extendible-prostheses.php). In some cases the tumour extension has involved the joint cavity of the knee which would lead or compromised surgical margins if the joint capsule were exposed peri-operatively. This may be clear on pre-operative imaging or be suspected with subtle effusions radiologically. 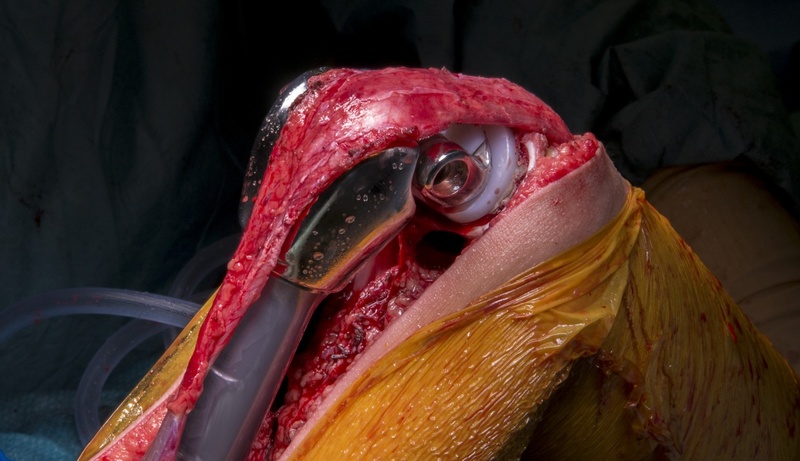 Consequently a demanding ‘extra-articular’ excision is undertaken to excise the distal femur and proximal tibial epiphysis en-bloc without compromising the proximal tibial growth plate or exposing the tumour. Institution: The Royal Orthopaedic Hospital , Birmingham ,UK.